As the Executive Director for the Center of Strategic and International Studies in Jakarta, Indonesia, Dr. Rizal Sukma is a noted and prominent voice in Indonesian foreign policy. 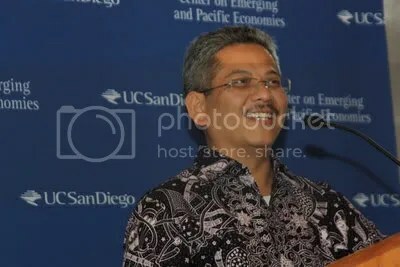 During his recent visit to UCSD through the Center for Emerging and Pacific Economics, he shared his knowledge on the geopolitical changes in South East Asia as well as Indonesia’s contributions to the global landscape as simultaneously being the second largest democracy and the largest Muslim nation. Despite his numerous accolades*, Dr. Sukma is one of the most humble and inspired political thinkers that I have had the privilege of speaking with. His visions and hopes for Indonesia’s future are practical as well as monumental. His talk on Asia Pacific’s development highlighted the effect that the upcoming changes will have on Indonesian government and foreign policy. In a follow-up interview he touched base on the evolution of Indonesia’s democracy since 1998 and the role of Islam in foreign policy. When talking about geopolitical changes in Asia over the last decade, perception is the only thing that matters. Anyone who works in international policy, Dr. Sukma included, understands that perception is what drives policy changes and policy makers. Every East Asian economist and foreign policy maker is watching China’s inevitable rise to power. Thus, the perceptions that China’s success is sustained by the decline of the United States, and India is rising as a major power, are important considerations. The misreading of the place and the role of these major powers in Southeast Asia, particularly Indonesia, is the concern of foreign policy makers like Dr. Sukma. The United States’ unyielding presence in Southeast Asia combined with the possibility of living under Chinese hegemony in the next couple of years threatens the independence and validity of Southeast Asian countries. The implications of these perceived geopolitical changes for Indonesia begin with the basic problems posed by power politics. Discussions within academia and policy makers all suggest that the competitive nature of China and United States politics will only increase. Also, the relationship between nations like China and India, as well as China and Japan, will be characterized by intense strategic rivalry for influence in the future. Southeast Asia worries that it will once again become a theater for competition among these nations. As China grows and becomes a force to be reckoned with in the financial markets of Asia, more Southeast Asian countries will rely on it as an economic resource. At the same time however, their growing presence in the South China Sea is leading to direct confrontation between countries like Vietnam and the Philippines. Indonesia remains neutral in these disputes, but as the United States strengthens its ties in the Asia Pacific and increases military presence in the region (Singapore and Philippines), Indonesia is concerned about Chinese reactions. The new initiative, the Trans-Pacific Partnership, is also at the heart of discussion among Southeast Asian countries. Another growing concern of the geopolitical changes in South East Asia is the polarization of the various Southeast Asian Countries (Association of Southeast Asian Nations members). Cambodia and Laos seem to be aligning themselves with China while Vietnam, Indonesia and Malaysia align with the United States. Indonesia’s strategy to combat geopolitical changes in the region begins with preserving Southeast Asia’s regional autonomy. Indonesia, as the largest country in South East Asia, wishes to maintain ASEAN’s unity and ensure that the members remain free. Indonesia further wishes to establish a dynamic equilibrium among the major powers that play a role in Asia Pacific. For example, the U.S., India, China, Japan, South Korea and Australia all participate in a web of multilateral processes within Southeast Asia, and ASEAN’s vision is to open up the region and allow all the countries to become dynamic players with more cooperative strategies rather than competitive ones. Unfortunately, ASEAN as a regional organization has been very slow to change. It has gone through many important milestones since the Cold War, but still requires consolidation. In 1992, ASEAN adopted security cooperation and in 2003 it agreed to bring democracy and human rights into its agenda. Soon after, it managed to get the ASEAN chapter global legal identity. Within the last few years there have been many important changes. Last year when Indonesia held the summit, a new decision to allow member states to help resolve intra-member conflict was initiated. An agreement set up a mechanism that would ensure that the South China Sea would not become a flash point in the future. The Cambodia summit last month was used to ensure that the current initiatives would continue to be implemented into 2015. Also, economic cooperation between the nations was stressed. Programs that would narrow the development gap between the original five ASEAN nations and the newer ones were established. Another summit in November with major powers including the U.S., India, and China has been planned to discuss the geopolitical changes occurring in the area, especially with the Iraq war winding down. The success of the strategy depends on the U.S.-China relationship and because of the uncertainty in that area, Indonesia believes that countries in Asia Pacific can help shape the relationship. There is a greater common interest between the two major powers rather than competition, and the relationship can be highly beneficial to the prosperity of Asia Pacific. The U.S. and Indonesia have a unique relationship because the differences far surpass the similarities. However, the relationship thrives because the common values of democracy are shared and the differences are managed for bilateral agreements. Before Indonesia became a democracy it was an authoritarian state and there were few political problems; as soon as democracy was instituted all hell broke loose. Radical Islamic groups entered the government as a powerful force and the relationship between Indonesia and the U.S. became strained. Especially after the United States’ presence in Iraq and Afghanistan, many Indonesian government officials did not want to touch the relationship. Indonesia, however, is trying to act as a moderating voice between the Muslim world and the U.S. As half of the Muslim world, Indonesia hopes to send messages of democracy and human rights to the Middle East. The trouble Indonesia faces is that the Muslim world does not see Indonesia’s Islam as the real Islam. The nature of Islam is very moderate in Indonesia. The religion came to Indonesia from India, through a process of assimilation and acculturation between Islamic teaching and global culture. The main religion in Indonesia was Hinduism at first, then Buddhism and finally Islam arrived in the sixteenth century. When Islam first came to Java, there was already a robust and long history of Hinduism and Buddhism. Islam had to adjust itself, which produced a kind of syncretism, and thus the religion was contextualized. Indonesia calls it the “Indonesianization” of Islam. Within Islam itself, the majority of Muslim believers in Indonesia are from the Sunni sect. Because it came through many different sources and blended itself with local culture it takes on a completely different identity in the global context. The Arab Spring brings new opportunity to Indonesia. Democracy is arriving in the Middle East and Indonesia hopes to share its knowledge. Indonesia can have dialogues with Egypt, Libya and Tunisia, not necessarily on the successes, but with the failures. Advice on how to deal with military and how to make sure justice reform is implemented can be shared. Indonesia also possesses experience on the place of Islam in large democratic arenas. The foreign ministry has organized dialogues among these nations. Since Indonesia democratized in 1998, democracy and Islam became part of the national identity. Before 1998, Islam was oppressed and it was prohibited to allow the religion to manifest itself as a political force. But after 1998, Islam took a center place in the political system. Many Islamic political parties formed and took place in the elections. But after the Sept. 11, 2001 bombings there became this universal cautious perception of Islam and the world. Other Southeast Asian countries believed that Indonesia was conducting a very dangerous experiment — in the sense that democratizing and allowing Islamic political parties and groups to play a part in the government would lead down a path of religious violence and political instability. Many thought of it as a recipe for disaster. It became a liability in the conduct of Indonesia’s foreign policy. Indonesia tried to change that perception by trying to articulate democracy and Islam as assets. Therefore, the foreign policy in 2003 and 2004 wanted to project Indonesia the third largest democracy and the largest moderate Islamic identity. Indonesia involved itself in promotions of democracy within ASEAN, for example in Myanmar. It is also very active in trying to convince other ASEAN countries on the promotion and protection of human rights. Indonesia encouraged the establishment of Bali Democratic Forum, a place where countries can talk about democracy and its benefits. Also, within the Islamic world Indonesia tries to be a democratic voice and tries to push other Islamic countries to take on democracy. The government wants to promote interfaith dialogue within Indonesia. Indonesia’s greatest challenge is changing the mindset of the people in the State Department who still view the country as the largest Muslim nation that happens to be a democracy. Indonesia wants its friends in the United States to see their country in a different light — as the world’s third largest democracy that happens to be a Muslim majority. *Dr. Sukma received his Ph.D. from the London School of Economics. In addition, he is the chair of the International Relations Division of the Central Executive Board of Mohammediyah, which is the second largest Islamic organization in Indonesia. He is also a member of the National Committee of the Strategic Defense Review. He also serves on the Board of Governors for the Institute of Peace and Democracy, and is the author of three academic books and fourteen articles on Indonesian and South East Asian foreign policy. Sukma is the first Indonesian to win the prestigious International Institute of Policy Studies in Japan’s Nakasone Prize, and Foreign Policy Magazine named him one of the Top 100 Global Thinkers of 2009.